Back in 2012, Mike was just Eva's roommate's friend. But as soon as they started talking, fireworks went off. Their relationship quickly went from friendship to love and the pair have "never looked back," as Mike puts it. This past Fourth of July, Mike popped the question under a different kind of fireworks. Nowdays the pair enjoy biking on the C&O canal, playing with the family dog, and socializing with friends and family. Their wedding will be this summer at the Congressional Country Club in Bethesda, MD, and I cannot wait! Eva's always stunning and I can't wait to see her all dolled up in her dress! I'm equally excited to see the look on Mike's face when he sees his bride. You could tell through the whole engagement session he was just in heaven getting to love on sweet Eva. Swoon! 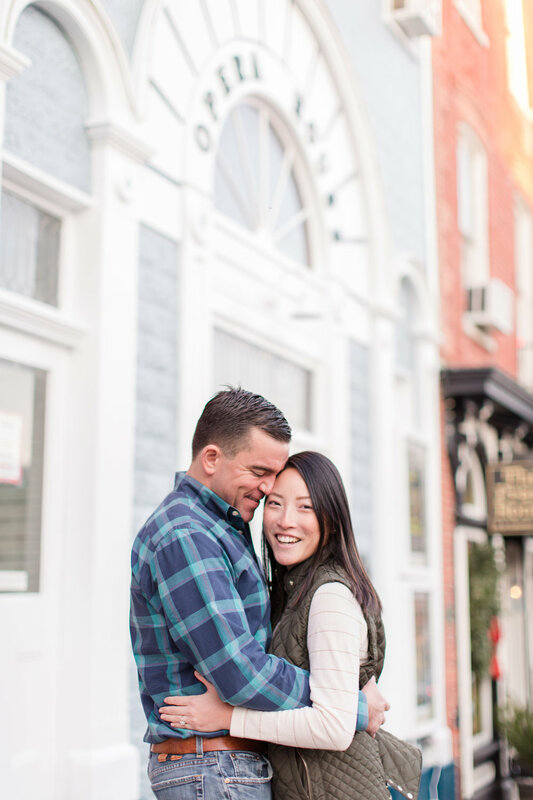 Eva and Mike drove all the way in from Potomac, MD, for their engagement session around Eva's hometown. Her parents still live down the road, so the pair followed their engagement sessions with a visit and a home-cooked meal. Sounds good to me! Thank you so much Mike and Eva for spending yesterday afternoon with me in Shepherdstown! I had so much fun and just love how these turned out! Congratulations and can't wait for the big day!